Metro transit constantly monitors and reviews feedback from customers and operators as part of the agency’s commitment to build a better transit experience for the St. Louis region. As a result, MetroBus routes and schedules are regularly updated to improve MetroLink connections and MetroBus on-time performance. 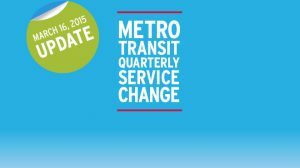 Specific details about the March 16 MetroBus service change updates, including new schedules and maps, can be found in the Plan Your Trip section under Service Changes. Customer Service representatives are available from 7:30 a.m. to 4:30 p.m., Monday through Friday, at 314-982-1406 (Missouri) or 618-271-7879 (Illinois). Please send me a 70 grand and a 11 Chippewa. Thank you. Gerardo, please email transitinformation@metrostlouis.org and they should be able to provide you with the MetroBus schedules you need. 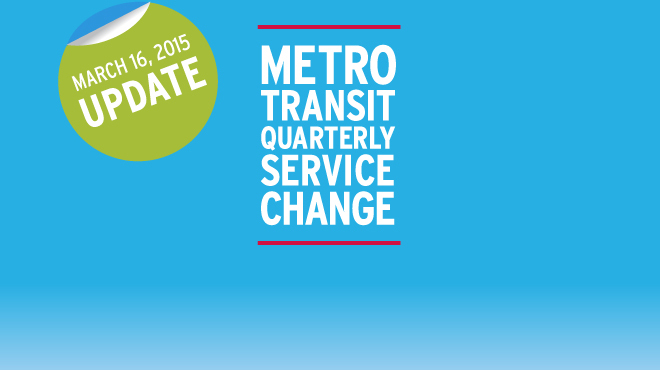 Looking for published updated schedule for Metrolink. Noticed the trains are leaving earlier from CWE station in the evenings heading westbound and the new time schedule is not posted at the station. The website’s schedule is from 2012. Jeanette, the MetroLink scheduled departure times haven’t changed. Can you fill us in on your evening commute? What scheduled time do you catch the train at our Central West End MetroLink Station and when does the train actually arrive? Did you notice this on a particular day? If so, when? I’ll make sure I send your feedback to MetroLink operations.